Dregg announces to the world his latest project to benefit mankind – the STAR SHIELD. And once again, the Turtles can not believe the gullibility of the humans and have decided to take a new attitude – the heck with ’em! However, Splinter convinces the TMNT that it is their duty to fight evil, even when the whole world is against them. With that said, Carter and the Turtles team up with April to “get the goods” on Dregg. At the location of the Star Shield construction site, our heroes are amazed by the sight of this “cross between a flying saucer and a battleship”. Convinced that no good can come from this, April successfully videotapes Dregg and Hi-Tech discussing the real purpose behind the Star Shield – to attack the people of Earth! But before April, Carter, and the Turtles can escape with the incriminating evidence, they are caught. After an obligatory fight scene, they narrowly escape. The Turtles return to the lair, while Carter escorts April to a local news station, where she hopes to convince the News Director to air the footage. Naturally, the News Director is a pro-Dregg supporter and believes the video tape to be a hoax. Meanwhile, Carter has been abducted by a team of TechnoGangsters and taken away. Back at the lair, April reports on her meeting with the News Director and is surprised to learn that Carter is not with the Turtles. Temporarily setting aside their concern for their friend, they decide to “pirate” the broadcast themselves. But before they can accomplish this, Carter arrives with ray guns blasting and destroys the tape. 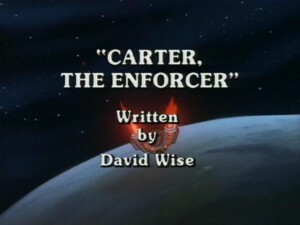 Meanwhile, two other characters, LANDOR and MERRIK, arrive from out of nowhere and help the Turtles defend themselves against Carter and the TechnoGangsters. But when the firefight is over, Carter, the TechnoGangsters, Landor, and Merrik are gone. The Turtles send April out to learn what she can about Landor and Merrik, while they are left to make heads or tails out of what just happened! They don’t have to wait long, after Carter and TechnoGangsters return to finish the job, Landor and Merrik, who have been trying to convince the Turtles that they are from the future and that they are trying to protect them, have no choice but to — go “BACK TO THE FUTURE”. In the future, the Turtles discover that Dregg won, and that Carter is the local ENFORCER. But something is unsettling – Carter does not appear to be any older than he was in the past and also appears to have the strength of his mutant form without mutating. 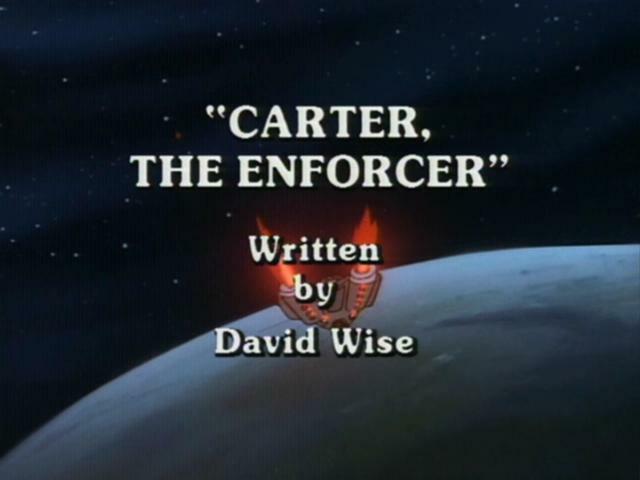 Soon, they discover that Carter is not Carter, but a robotic droid, and that he never did betray them. They must return to their own time before this bleak future really does come to pass. The Turtles arrive just in time to join forces with the real Carter, destroy the bogus Carter, and prevent Dregg’s Star Shield from becoming operational. Later, April takes them to meet Landor and Merrik, two small children playing in the park.